Adult booklice are quite small, ranging from 1⁄25 to 1⁄13 of an inch. Most booklice are found outdoors on or under the bark of trees and shrubs. Outdoor species are commonly referred to as barklice and are usually winged as adults. Species that frequently inhabit homes and other structures are wingless as adults, have extremely flattened bodies and are translucent white to gray in color (Figure 1, Figure 2). Booklice may also be referred to as psocids or "paper lice." However, they are not true lice and do not bite or transmit disease. Interestingly, in some species of booklice, only females are present and immatures develop from unfertilized eggs, a process called parthenogenesis. Both male and females are present in some species. Females lay eggs which are either bare or encrusted and may sometimes be covered with webbing. 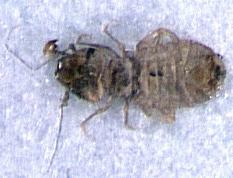 Immature booklice, called "nymphs," look very similar to adults but are smaller. There are four to six nymphal stages. 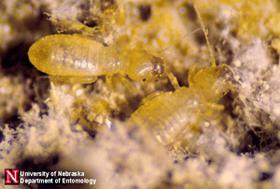 Booklice feed primarily on microscopic fungi and mold. Therefore, they are most often found in damp, dark areas. Such places may include basements, crawlspaces, kitchens, leaky plumbing, unvented storage areas, and around over-watered houseplants. They may also show up in recently-built homes where they entered during construction and were enclosed in a wall after siding and sheetrock were installed. Booklice are often associated with old books or other papers that are stored in damp conditions. These conditions promote the growth of mold or fungi on the pastes and glues of book bindings. They may also be found in food goods stored in humid conditions that support mold development. While their presence can cause great annoyance, they rarely cause significant damage to items. The presence of booklice can be quite an annoyance; however, they rarely cause significant damage to items. Most often, the damp conditions and developing mold or fungi have already caused the damage. Reducing moisture and maintaining relative humidity below 50% will provide excellent control of booklice. Use a fan or dehumidifier to dry out damp rooms or other locations. Repair any leaky plumbing (Figure 3). Try to determine and remedy the cause of any condensation around doors, windows, air conditioning units, or other areas. Eliminate any standing water. Do not over-water houseplants. Reduce or eliminate potential harborage areas by sealing up cracks and crevices. Remove or dispose of items that could be harboring mold and fungi, such as old books, cardboard, papers, wallpaper, and food goods stored in damp conditions. Those items that cannot be removed or disposed of should be stored in airtight plastic bags or containers in cool, dry, and well ventilated areas. Clean up any spilled food goods such as cereal or flour that could serve as a source for mold growth. With infestations in new construction, the problem will lessen over time but may take several months. Pesticides may not be needed to control booklice, especially if the recommendations listed above are followed. However, residual spray or dust insecticides may be applied as spot treatments or in the cracks and crevices of known or suspected harborage sites. For a list of pesticides you can use, consult the North Carolina Agricultural Chemicals Manual and ALWAYS read and follow all label directions for mixing and applying pesticides carefully. Figure 3. 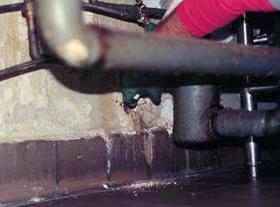 Leaky pipes can create an area conducive to booklice.